Monday 16th July 2018 630pm - late JuJu's Bar & Stage 15 Hanbury St, E1 6QR No registration is necessary. Free entry. July CryptoParty Address (Silkie & Fabio) + drinks. Ramy (@RamyRaoof) Secure browsing with Tor & VPNs In this workshop we will learn more about secure browsing, the difference between privacy and anonymity, how internet traffic moves with all our data, what’s the difference between using Tor and VPNs, when to use what. We will also install Tor and learn how to use it. Fabio (@fnstudio) Intro to infosec, a crash course You've heard about Tor, GPG, insecure passwords, hard disk encryption, etc, but you don't know where to start from? Join this workshop for a 45-min crash intro to all things infosec. We'll cover: threat modelling + possible scenarios, risks, countermeasures. A quick survey of privacy enhancing technologies and best practices. More TBD soon! Stay tuned. Griff (@g__ferris) Facial recognition Imagine a world where the state can watch anyone through all-seeing cameras, identifying people's faces, tracking their movements, and alerting authorities to “political dissidents” or other “persons of interest”. Sound familiar? It should do - because the UK could be heading that way. 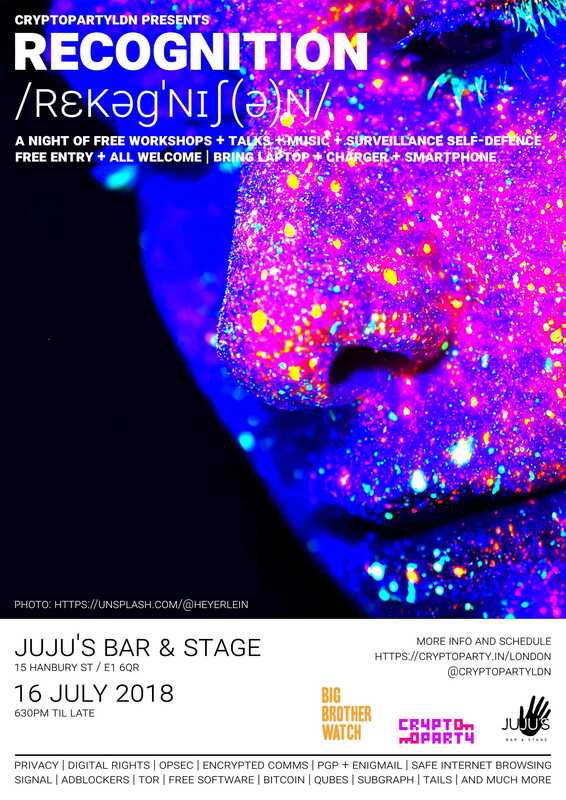 Come and hear how facial recognition surveillance is being quietly rolled out in the UK and what - with your help - Big Brother Watch will do to stop it. Taila Voice recognition Imagine if you recognised the voice of every person you’d ever had a 5 second interaction with. Impossible? Maybe for you and I, but not for AI. Voice recognition technology is used to create a unique voiceprint, as sensitive as a fingerprint. Taila will discuss how she uncovered the Government's mass collection of voice IDs and future risks. Pippa King (@pippa_king) Biometrics in schools UK schools have been taking and using children’s biometrics since 2001 - initially without parental consent, until the Protection of Freedom Act 2012. Even now schools are not fully aware of their legal obligation for consent to use students' biometrics. Is the fact that millions of children are using their biometrics for everyday mundane activities in school a good idea? Learn what your and your child’s rights are around the use of biometrics in education, what information might be stored, who has access and who their biometric data can be shared with. Ramy (@RamyRaoof) Civil Liberties vs Dictatorships Our special guest, Ramy Raoof, is Senior Research Technologist at the Egyptian Initiative for Personal Rights, a Research Fellow at Citizen Lab, and a Director of the Tor Project. In this lightning talk, Ramy will provide quick updates and an overview of the status of surveillance and targeted digital attacks against civil society groups and activists in the Middle East and North Africa. 1 May 2018 People of the world, encrypt!